JEDEDIAH ELDERKIN. 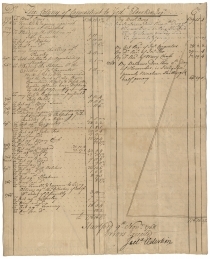 Autograph Document Signed (“Jeda Elderkin”), Hartford, November 9, 1768, being an accounting of monies owed to and collected by Elderkin in Connecticut for services rendered as King’s attorney from December 1754 to 1766. 2 pp., recto and verso, double-folio. The wildly unpopular Stamp Act of 1765 taxed the American colonies so that Britain might recoup some of the expense of the costly French and Indian War from the region that stood to gain the most from the victory. The colonies resisted, arguing that only the colonial legislatures could legally enact taxation over them. Several colonial legislatures refused to comply with the Stamp Act, and the Connecticut Assembly passed its own resolution condemning it on December 19, 1765. 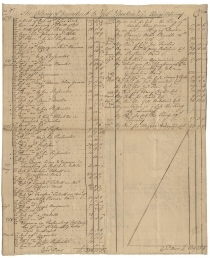 Elderkin’s 1765 entry must refer to legal work he did on the colony’s behalf in suing collectors of the excise tax, perhaps including fellow king’s attorney Nathan Frink of Pomfret, who had been appointed deputy stamp-master for the northern part of Windham County. In 1758, old political, geographical and ecclesiastical conflict between Massachusetts and Connecticut led to a fight in the Woodstock church. 50 years earlier, Connecticut’s religious establishment had adopted the “Saybrook platform” of more orthodox Puritan beliefs to be enforced by a centralized state-wide assembly of churches. However, Woodstock and two other “teeth towns” - jutting below the otherwise straight border with Massachusetts - did not become part of Connecticut until 1749; their population still adhered to the local church based “Cambridge Platform.” In 1756, a group led by Rev. Abel Stiles broke away from the old congregation, but still claimed the church, and with it the power to tithe. In 1758, the “old church” party won a vote to assess all estates in the society, regardless of which church the estate-owner belonged to. After an unenforceable court decision, the conflicting parties took it upon themselves to settle the matter. Jedediah Elderkin (1718-1793) became one of the most successful attorneys in eastern Connecticut after his admission to the bar in 1747. He served as king’s attorney and later state’s attorney for Windham County from 1754 to 1766 and 1774 to 1788. 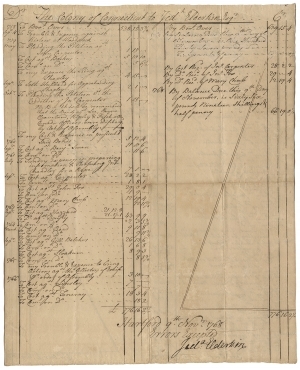 He also served as Colonel of the 5th regiment of the Connecticut Militia during the French and Indian War, and later was a member of the convention in January 1788 to ratify the U.S. Constitution. Folds and mild toning, but fine overall.